big sky diy: Finished a few projects! The summer is flying by, I can't believe we are half way through July! I have been busy painting my house downstairs, but have had time to get a few thing fun projects done along the way. Here are a couple of finished projects that I thought I would share with you. I haven't crocheted in years but I picked it up again and finished this afghan. This pattern is from the Bernat Satin - Around the Seasons Afghans. 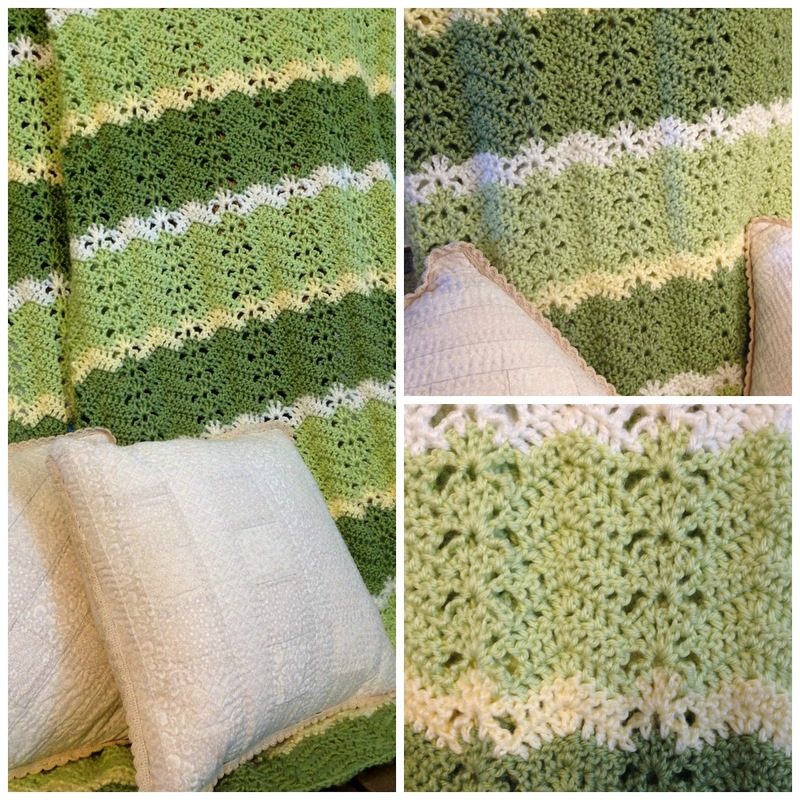 This is the Spring - Lacy Ripples pattern, I used the same yarn and colors as in the pattern. I think it turn out great, it is a easy pattern and goes quickly. 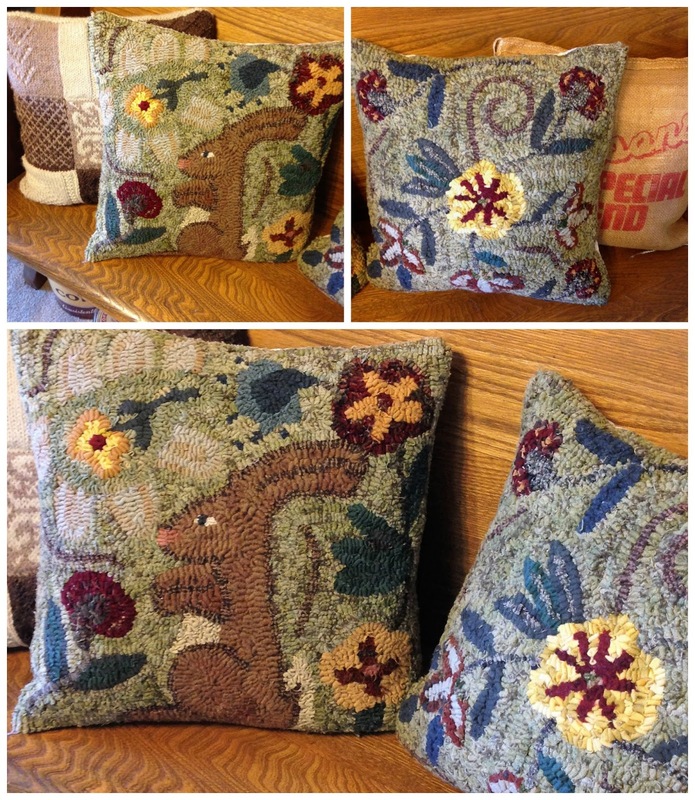 I made the pillows years ago using monochromatic colors, and promise stitching. If you are not familiar with promise stitching it is an old art in which you pre-wash the fabric but never iron, the batting is flannel and is never prewashed. Once you have your quilting completed the quilt or pillow is washed and when the flannel shrinks it gives it that wonderful antique look. I completed this rug hooked pillow that matches my first one I completed years ago. I like to try different things and this is a fun project that goes fast. I have enough to make a third matching pillow so I hope to get that done soon. Lucky has a new friend his name is Hubble. 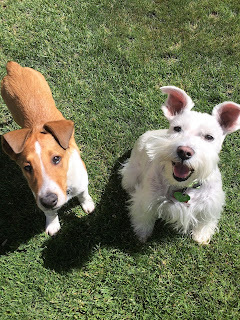 I think they will be great friends. May Friends and Family bring light to the cottage, warmth to the hearth and joy to the soul.